Jeff Preston did a fantastic job on the cover for our first Hope Preparatory School Adventure. This should be available in a few more weeks. For now, I thought an early look at the cover might whet some appetites. The last of the interior artwork solicitations for the first scenario were sent out last night. Both Mike Munshaw and Patrick Sullivan have agreed to participate in this project. We've also recruited Jeff Preston to provide a cover. Wesley Street is designing a series of detailed maps of the school that should be a big help in this scenario and future ones as well. John is writing this scenario, and the current draft is progressing smoothly. A minor revision to the Freshman handbook has been uploaded to DriveThruRPG, and an e-mail was sent to all buyers. This revision addressed the white on black text present in the sidebars. Anyone using a PDF reader that supports layers (including Acrobat Reader 6+ or FoxIt) can now turn off the sidebars layer to reveal a black text on white background box. This should be a bit friendlier for everyone's toner/ink supplies. The revised file is immediately available to all new purchasers as well. We're very happy with the preliminary sales reports that we've seen from DriveThruRPG regarding our numbers on the Hope Preparatory School Freshman Handbook. We were briefly ranked in the 30s in the Small Press Top 100. For a first product from an unknown publisher, that's not too shabby. Thank you to everyone for the support we've received. 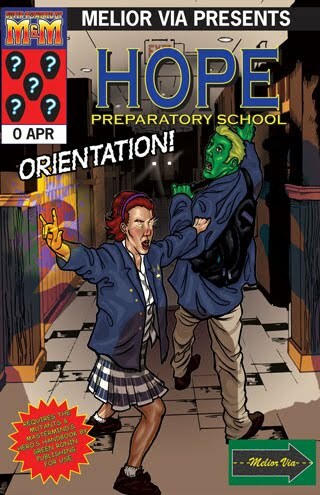 Today, the Hope Preparatory School Freshman Handbook went up for sale on DriveThruRPG.Com. This is Melior Via's first release, and I'm pretty excited to have it out there. Mind you, this just means that the deadline for our next release is looming ever closer. Hope Preparatory School is a privately funded institution dedicated to preparing tomorrow's metahumans for whatever paths might lie ahead. With a tradition that stretches back over 60 years, a world-renowned faculty, and affiliations with all of the best universities, HPS is the place to send your child to prepare him or her for life. 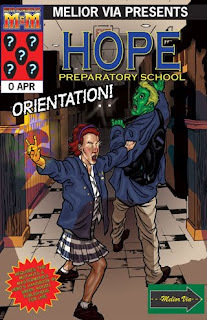 The HPS Freshman Handbook provides the background material and character creation rules compatible with M&M 3rd Edition for Melior Via's line of Hope Prep Adventures, as well as plenty of information and adventure hooks to run a campaign set within a metahuman high school. Our draft came back from the editor, and I'm very happy with how things looked, so it went directly from there to layout. Layout went smoothly, and now the Hope Preparatory School Freshman Handbook is in the hands of our trusted proofreaders. In just a few more days, I hope to be making the final tweaks and uploading it for sale. In the meantime, I thought it might be worth talking about some of the artwork. While it may not be the most comic-book style piece, I wanted to start out by talking about the HPS logo. That's partly because it's a core part of the project -- it's featured on the cover and on the books' watermark. But, it's also because it's something that I had a lot of fun working with Wesley Street to design. So, let's break down the elements of the logo. It's Latin. Why? Because I studied Latin for too many years to not take advantage of it in situations like this. It translates, roughly to "Saving the World, One Student at a Time." The Sphere is meant to represent the Globe, indicating that HPS is a global organization. The Torch is meant to represent the light of understanding. The Atom in the book represents knowledge. As the school does cover far more than just the sciences, this might seem a bit specific. However, the it harkens back to the Latin (OK, I was focused when I designed this.) "scientia" meaning knowledge. The Balance represents justice. I particularly liked the center of this scale as it seemed sword-like. Particularly appropriate for a school that focuses on educating those who might one day see justice carried out. Finally, the wings on the outside of the circle are meant to represent the superhuman. So, what's it all mean together? Hope Preparatory School is a place where those with special abilities can come to a greater understanding of the world, balancing knowledge with justice. At least, that's the intention. I'm sure others may interpret it differently. Or tell me my Latin's out of practice. So, as we're getting down to the final stages pre-release, I wanted to babble a little bit about a design decision. Early on in the process, I decided that Melior Via products would all be digest sized. That means 5.5" x 8.5" aka, the size of a piece of letter paper folded in half. It's not a conventional size for RPG publishing, but it seems to be garnering support. I think that increasing support has good reason. I didn't make the decision lightly, so I thought it might be worth sharing the logic that went into it. We're an electronic publisher. That seems obvious, but it's worth pointing that fact out. Because we publish electronically, I think it's important that our books are as friendly as possible for digital media. There are very few electronic readers currently available that are well suited for displaying a letter-sized sheet of paper. Lots of people have posed workarounds for this. My solution was easier: Make the page smaller. Digest is booklet friendly. If you don't want to read your materials on a screen and you don't have an ereader, then digest is just easier to print out and make a booklet than letter sized pages. PDF readers can send a print job to the printer in booklet format so that a user can print the book, fold it in half, and staple it along the midline. Bam! Instant (short) book. Digest works with Widescreen. For those who are using a widescreen laptop or desktop display, most PDF readers enable the user to display two facing pages. With a digest sized book, both of those pages remain readable. Digest works with POD. Finally, I'd like to keep our options open for eventually doing Print on Demand releases. And, at the end of the day, even allowing for an increased page count, it's much cheaper to print on digest sized pages than it is on letter sized pages. That means more affordable books for our customers. Several pieces of artwork for The Hope Preparatory School setting book came in this week. When things get a little closer to release time, I plan on posting a few selections. Also, this week, development on the introductory scenario - Orientation, has begun in earnest. This scenario will be available as a free download to add more information, NPCs, and sample characters to the HPS setting. Melior Via will be releasing that a few weeks after the setting book becomes available.